According to a rough estimate, around 74% of people who encounter a 404-error page will leave your website without ever returning. This implies that you’re losing potential customers on a huge scale. What is even worse is that customers who see a 404 error page are less likely to re-visit your website for something they might need in the near future. Do you actually want to bet your money on losing potential customers just because your web developer didn’t think things through? It is okay, you don’t need to fire your web developer right away. At least, not until you read the whole blog. Presenting the most creative 404 error pages. Steal them, learn from them. But whatever you do, do not ignore them. Some people take things too seriously. Be it a failed project, an unsuccessful relationship, or even some 404-page errors. 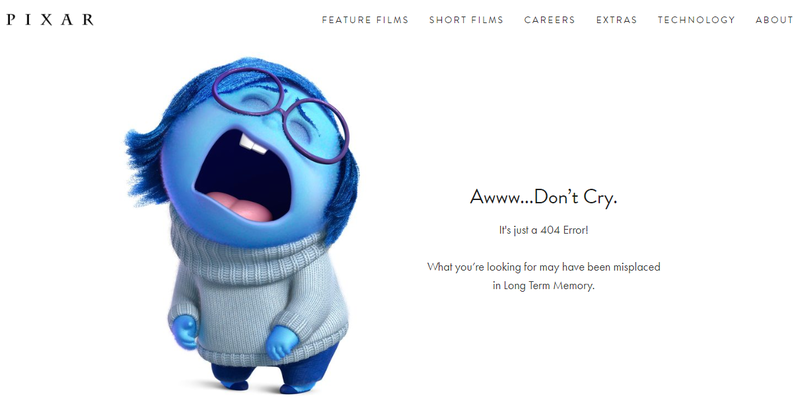 This humble 404 error page by Pixar featuring Sadness from the 2015 hit movie “Inside Out”, is a straightforward page which lets users know that they have hit the rock-bottom while browsing a page. The key takeaway: You don’t need to fabricate a needlessly intricate 404 error page. You can be as simple as Pixar & follow this practice throughout everything that you do. From your latest project at work to talk with your loved ones. The key takeaway is to keep things simple. No need to impress people if they don’t get what you’re trying to do. Attention is the most precious currency in this technological era. If you can grab the fleeting attention span of your user, even if it is from leveraging a 404-error page, what more do you need? Kualo did an excellent job of reeling in users at every turn on their website, even when they land on a 404 error-page. A hosting company that has been in business for around 15 years knows how to play their cards right. First, the greeting message is engaging itself. The key takeaway: Why does a 404-error page need to be monotonous and ominous? Kualo took their tedious 404 error page and turned it into something totally engaging and riveting. A game which can keep the users hooked for hours on end (just try once). When I first came across this page, I spent around half an hour on the game (I managed to get at level 13, go beat it if you can). The takeaway is that if you’re able to grab the attention of the user, you can do anything with it. You can sell your product, you can coax the user into subscribing to your newsletter and they will do it without any questions asked or feeling compelled into it. Why just lead the user to a page where they must leave anyway? Why not sell something or jump on a final marketing effort before they bounce off? A digital agency based in the USA tested the waters with a different approach on their 404-error page. When you land on a 404-error page on their website, you will be bombarded with numerous services that the company is offering. The key takeaway: Whether you’re selling a product or offering a service, you can jot down your amenities on a 404-error page. What you can do is to list the services that are related to the page where the error lies. No need to overcrowd this page. Just like Bluefountainmedia, incorporate a quick apology, and get right down to your other offerings that the user can avail instead. If your intent is not to sell or keep the user engaged, you can try what homestarrunner did. They’ve capitalized on humor to entertain their users. Pick a joke or make a meme, and flaunt it on your 404-error page. This will perk up the mood of your visitor after the letdown, and make it easier for you to pitch them whatever you want to sell. The key takeaway: Just like unwelcome news float fast than any other, Humor sells better than any other form of a pitch. You can use humor to sell your services as well. Check out how homestarrunner have listed their menus at the bottom of the page. Fail to read what the error page says? No need to worry. Who cares? As long as you can keep the user entertained, who will worry about the text anyway. Kvartirakrasivo is an epitome of an error page where animation coupled with the right background music worked wonders. Certainly, the weirdest error page on the list and also one of the most out-of-the-box. The key takeaway: You can leverage the prowess of simple animation to keep the user glued to the site. Check how the website has used social networking icons to engage people with their social media channels. The key takeaway: In the case of Plasm, you can see that the company is offering a grid layout for the website. And in the 404 error page, you can see its reflection. This means that you can even let them steal a glance at some of your services in the 404-error page or even incorporate a video that will explain what you’re offering. 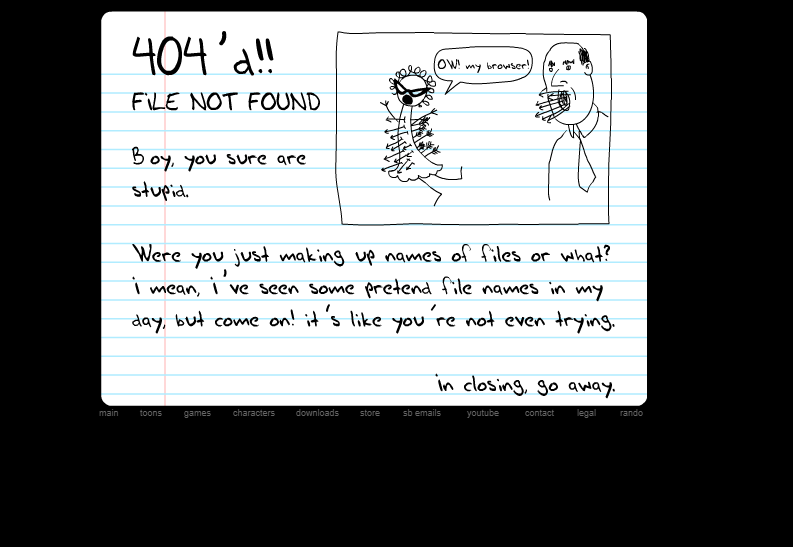 There is so much that you can do with your 404 error pages. You can take any of the above-mentioned ideas and use them to your benefit. Or you can unleash your own creativity and use some of your unique ideas to get the attention of the users even with 404 error pages. Why waste the opportunity when you can make some good use of 404 error pages?